Proper bowing is an important manner as a working member of society. Photo from 1988. 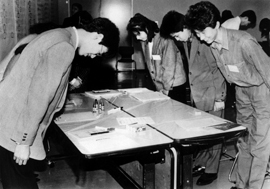 The four pillars of Japan’s postwar employment system have been lifetime employment, the seniority wage system, the bonus system, and enterprise unions. Although only about one -fourth of the labor force enjoys all of these conditions of employment, those who do are the most privileged part of the labor force. There is the greatest competition for jobs in large corporations that carry these benefits, and smaller companies try to imitate them in order to keep their workers. These employment practices are expensive for companies to maintain, and they reduce employers’ flexibility to respond to changing economic conditions. They are not offered to every worker. The Japanese employment system distinguishes between regular or permanent employees, who are entitled to these privileges, and contract or part-time workers, who do not receive them. Regular and contract or part-time workers may work together in the same company, and even do the same jobs, but their employment conditions may be very different.Large companies are able to offer these privileged working arrangements to regular employees in part by entering into relationships with smaller subcontracting companies whose workers do not enjoy such generous terms of employment.